An introduction to analyzing the 28 major currency pairs and the benefits. This is achieved by Technical analysis of the charts for different time frames. The result of the Technical analysis is combined with data analysis by using Excel. After using TA charts for some time on Forex just like with stocks it became clear that there is an advantage with Forex not present when stock trading. This advantage should be made visible and materialized in some way. Currencies are interconnected with each other and offer for this reason the possibility to be analyzed in more ways than only with Technical analysis as with stock trading. However, it is the use of Technical analysis itself that makes this possible by analyzing the results with Excel. This benefit should be made visible and materialized in some way. This is how I came to the decision to create the FxTaTrader "Forex Ranking and Rating list" and the "Forex Currency Score". See screenshots here below. I did not find anywhere anything similar, including on the Internet. It however is something I needed in order to get a clearer view of the whole market. It is a common practice among technical analysts to use the larger time frames when making a trading decision on a short time frame chart. It is also common practice among technical analysts that confirmation of strength/weakness in a currency can be achieved by looking at more than one chart with the currency in that pair. The use of multiple time frames compared to the use of multiple pairs with a currency in it is what the "Forex Ranking and Rating" list provides. It provides even more because when using all the information of all pairs and currencies together the whole market is analyzed. Let me explain this in more detail. When used in the traditional way a currency pair will be looked into in multiple charts of that pair and also with different pairs with the currency in it as a reference point. However, that currency is connected to 7 other currencies and all of those are interconnected with each other. For the EUR/GBP it is possible to look at .e.g. the EUR/USD and the GBP/USD to see if the view on the EUR/GBP is supported by these other currency pairs. A GBP/USD can also be looked into by looking at a GBP/AUD and see if the view on the GBP is there similar to the USD and the EUR. A EUR/USD can also be looked into by looking at a EUR/AUD and see if the view on the EUR is there similar to the USD and the GBP. The above example is a set of closed circuits consisting of, in this example, the currencies of the EUR/GBP pair and the currencies USD and AUD to see if the EUR/GBP view is being confirmed by other pairs. 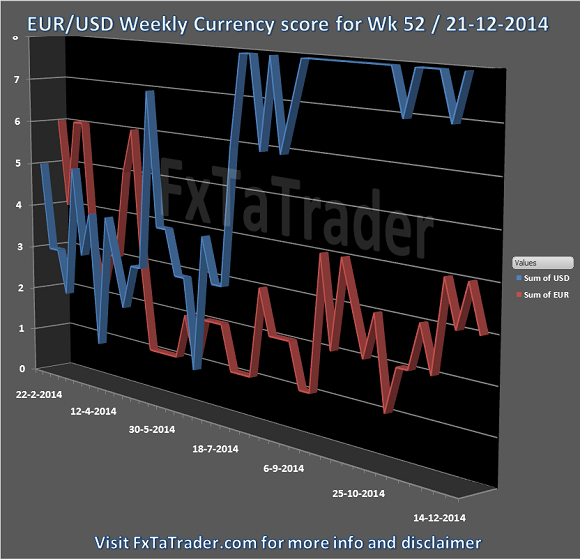 The set consists of a circuit of the EUR with the USD and AUD and a circuit of the GBP and the USD and AUD. Together they form the set of 3 currencies with an overlap in the segment "EUR / GBP". See the screenshot below. If we then extrapolate this example into the major currencies it works like this: There are 8 major currencies and 28 pairs. Suppose that the above example would be used for all these pairs it would have the following result: 28 pairs with each 2 currencies will be compared with 6 other currencies. The 2 currencies in the pair itself do not play a part. These are 28 x 2 currencies in 2 separate closed circuits of 7 currencies each. See screenshot below, it is an example of a pair, meaning 2 currencies, being compared with the other available major pairs. In theory, this should be done 28 times manually to get a complete overview of the whole market.. In practice this will not be done but when looking at a pair and trying to see if a currency is strong it will be compared with several other pairs. Suppose that in a week 7 charts are being analyzed and each compared with 3 other pairs then this makes already a total of 28. It may very well be that a specific chart may be used twice because a certain interesting pair has to be compared after a previous pair also requested that chart for comparison purposes. It is hard to remember all the charts by heart so opening the chart is then the best way. The way the "Forex Ranking and Rating list" and the "Forex Currency Score" model works is as follows: all the 28 pairs are checked at once and then this information is being stored and in this way all the charts can be compared with each other. This is done in a semi automated way. The charts are being analyzed by human, me in this case, and the calculation for the models is then done automated. To make it clearer what we are dealing with just think about e.g. the relation of the GBP/CAD with the EUR/USD? Which charts would then have to be researched? It is something that would not immediately be researched because the direct link does not to seem to be there. However, these currencies are interconnected because each currency is connected to 7 others which are similar for each currency. All currencies are interconnected and have an influence on each other. 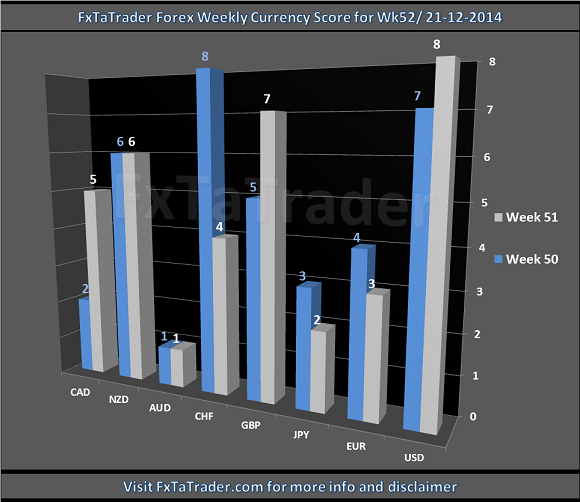 The "Forex Currency Score" solves the above mentioned issue for each currency. 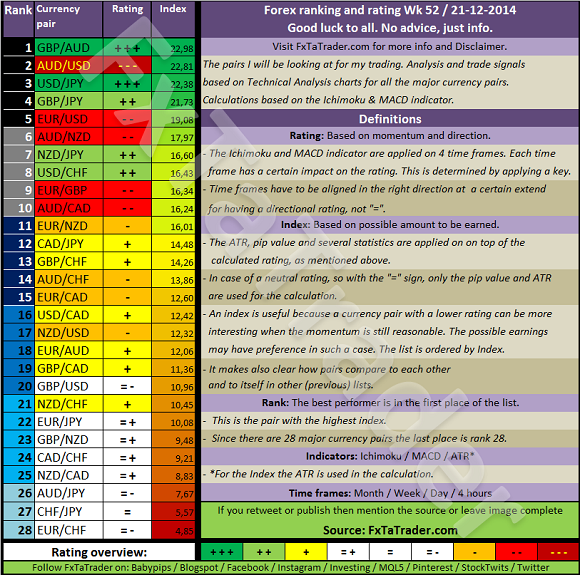 The "Forex Ranking and Rating list" does this for each pair. By analyzing the direction of each chart and using all that information a clear overview can be generated. Even when analyzing each chart separately may seem a lot of (extra) work, the result gives so much more in return which can impossibly be created in any other way. Although the explanation may seem simple and clear there is always risk involved. I added a disclaimer to my blog for this purpose. If you would like to use this article then mention the source by providing the URL FxTaTrader.com or the direct link to this article.